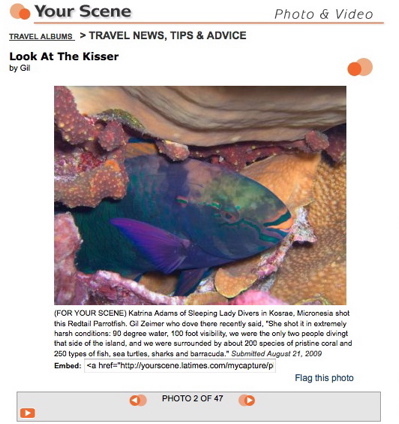 3 Paths to Diving Bliss – Kosrae by Gil Zeimer, Travel Writer is showcased on page 12 of this beautifully designed diving magazine published in Singapore. It features a map to give the reader a quick orientation of where Kosrae and the Federated States of Micronesia are in the Pacific Ocean, relative to the Solomon Islands, New Guinea, the Philippines, and the Equator. 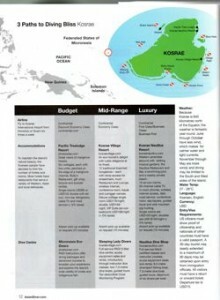 My article provides an overview of how to get to Kosrae by air, the three types of accommodations and their dive centres, weather and water temperatures, currency used, and entry/visa requirements. Download “3 Paths to Diving Bliss – Kosrae” article (PDF). 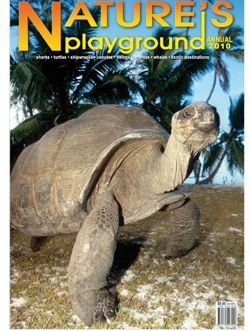 Nature’s Playground 2010 Annual from the editors of Dive Pacific Magazine. “Kosrae, Untapped Pacific Gem” by Gil Zeimer, Travel Writer is featured on pages 107, 108 and 109 of the 10th production of this slick, coffee-table quality magazine featuring articles about sharks, turtles, shipwrecks, cenotes, belugas, mantas, whales, and exotic destinations across the globe. 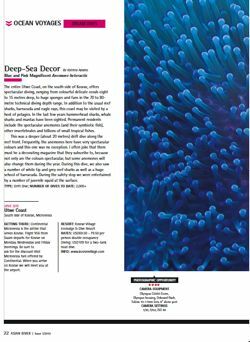 “Ocean Voyages Dream Dives” article, Asian Diver Magazine, January 2010 I edited this “Deep Sea Decor” article for Katrina Adams of Kosrae Village Ecolodge to accompany a beautiful image she took of a Blue and Pink Magnificent Anemone heteractis for this Singapore-based magazine. She said, “This was a deeper (about 20 metres) drift dive along the reef front. Frequently, the anemones here have very spectacular colours… I often joke that there must be a decorating magazine that they subscribe to, because not only are the colours spectacular, but some anemones will also change them during the year.” Download Asian Diver Article (p.1) Download the Anemone Photo. Marin Scuba Club Slideshow Presentation, November 18, 2009 I made a 130-slide presentation to the Marin Scuba Club of some beautiful land and underwater photos of this island in the middle of nowhere. (Most of the images were taken by Katrina Adams of Kosrae Village Ecolodge.) I told them that Kosrae offers pristine reefs, vast variety of fish and indigenous corals, and 60 moored dive sites that further protect the reef. When I compared my photos to those I took at Australia’s Great Barrier Reef, the diving and sealife was more vibrant in Kosrae. So if you like 87-degree water year-round, 100-foot or more visibility, and an island populated with friendly natives, plan your trip to Kosrae. 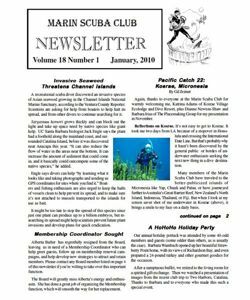 Download Marin Scuba Club January 2010 Newsletter. The Travelin’ Diver’s Chapbook, 2010 Edition, Nov/Dec 2009, Vol. 24, No. 11 from Ben Davison’s Undercurrent. 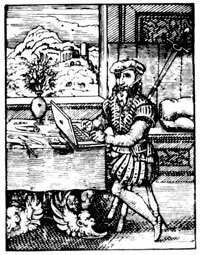 While the editors of Undercurrent are the chapmen, the subscribers are the balladeers. 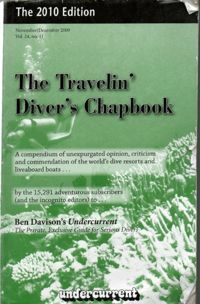 The Travelin’ Diver’s Chapbook is a compilation of reviews of dive resorts, operations, and liveaboards worldwide from the readers of Undercurrent, the private, exclusive consumer newsletter for scuba divers since 1975. This story by Gil Zeimer and photo by Doug Beitz of Kosrae Nautilus Resort appeared on 9/13/09 in the SF Chronicle’s “Just Back From” column in their printed and online travel sections. I went because: Kosrae offers some of the world’s best scuba diving, with pristine reefs, 100-plus-foot visibility, 85-degree water, and more than 200 species of coral. 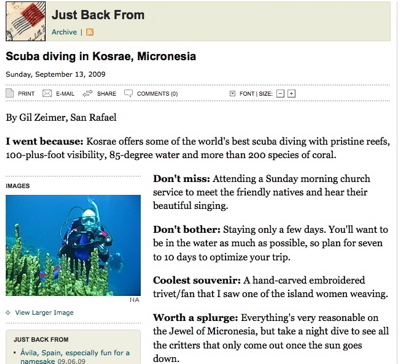 This story by Gil Zeimer and photo by Katrina Adams of Kosrae Village Ecolodge appeared in the Los Angeles Times Travel Section’s “Scene Online” on 8/21/09. Read this article.